2 worlds collide into a single ball of accidental awesomeness. 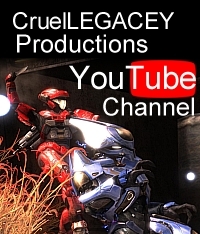 Mythic Tyrant and CruelLEGACEY have teamed up to bring you Halo Reach Mythic Fails; a Tyrant Legacy Production. This collection of fails and laughs features some of our favorite disastrous attempts to conquer Halo Reach on Legendary with All Skulls On. This entry was posted in Community Spotlight, halo reach, The Fails of Reach, Video. Bookmark the permalink.